The Philippine Alliance of Human Rights Advocates (PAHRA) congratulates the more than 150 human rights defenders from around the world who are now gathering in Paris to renew the commitment to advance human rights, and to fight against tyranny repression, and discrimination. It has been twenty years since the rights and duties of human rights defenders have been recognized and guaranteed under international laws with the adoption of the 1998 United National Declaration on the Right and Responsibility of Individuals, Groups and Organs of Society to Promote and Protect Universally Recognized Human Rights and Fundamental Freedoms). They are those who dare to stand up for what is right, speak out against abuse, denounce violations, demand action, fight for a better world. in peaceful and non-violent means. The Philippines (Government) does not belong in the UN Human Rights Council and its membership must be rescinded or suspended for miserably failing to uphold human rights standards. The UN Human Rights Council should hold the GRP accountable to standards expected of members. The Duterte administration continues to consciously and deliberately sustain the de facto social cleansing policy (War on Drugs) which results in the mass EJKs and the multi-fold human rights crisis which continue at the same rate. The Duterte administration continues to shield police officers and death squads from litigation and forces them to be more violent through forced quotas and reward systems. Duterte has vowed to slaughter thousands and continues to slaughter into the thousands. We, the organisations named below, make this statement to express our serious alarm about the widespread arbitrary arrests of children taking place throughout the Philippines under the ‘Oplan Tambay’ project of the Philippine government. A local legal research and policy advocacy group working for the protection of indigenous peoples and local communities urged the Asian Development Bank (ADB) to reconsider funding authoritarian regimes who do not tolerate civil-society groups, noting that some of the massive infrastructure projects funded by the multilateral lender have historically impacted on the lives of indigenous and poor upland communities. Legal Right and Natural Resources Center/Friends of the Earth Philippines Executive Director Norly Grace Mercado also stated the need for a meaningful consultation between the civil-society groups, specifically the marginalized and the ADB. “Also in our analysis, we said that transportation and infrastructure have been directed in massive superhighways ports and airports. [Such] megastructures sometimes span several regions [that] cut across key biodiversity areas and culturally important heritage sites or indigenous territories and ancestral domain,” she said, adding that the ADB had also admitted that around half of the total number of public-sector loans projects funded by the bank inflicted involuntary displacement of communities. The ADB, Mercado added, also failed to consider among its proposed strategic priorities one important worsening trend in the region, which is shrinking democratic space for civil-society organizations and communities. “This is evident in the growing incidence of human-rights violations, which results to chilling effect in terms of communities in civil-society groups,” she said. Mercado also urged the ADB not to only focus on infrastructure but, more important, on governance and in pushing for the environmental and social safeguards, which will give way to ensure a sustainable and inclusive growth that will consider social justice and human rights. Workers fight dictatorship, defend human rights! 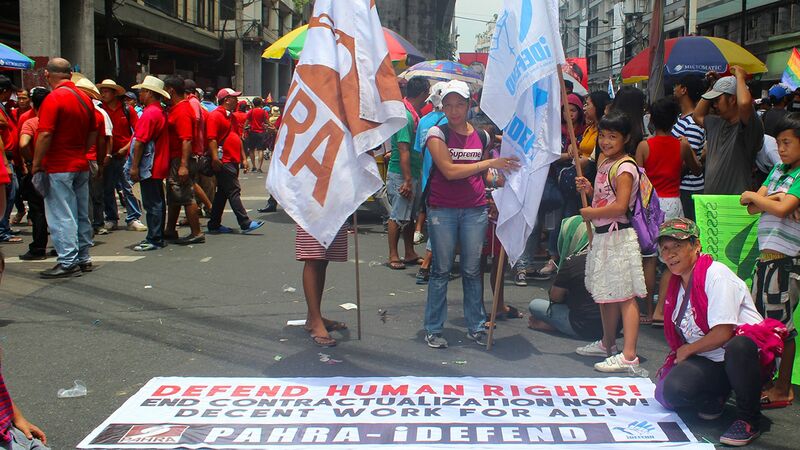 The Philippine Alliance of Human Rights Advocates (PAHRA) is one with the working class in commemorating Labor Day. We add our voices in solidarity with the toiling masses specifically in demanding for the end of contractualization in the country and the respect, protection and fulfilment of workers’ rights. The Duterte administration’s failure to end contractualization after almost two years in power, reveals even more its inability to heed the sentiments of the workers, to protect their rights and promote their interests. Its pronouncements have been mere rhetoric, devoid of sincerity and substance. Its commitment to advancing the right to decent work and to just and favourable working conditions remains to be empty promises as illustrated by the national government’s rejection of labour –related recommendations during the 3rd cycle of the Universal Period Review in 2017. These include its refusal and/or lack of political will to end contractualization, implement a national minimum wage, address gender wage gap, and sexual harassment of women in the workplace. A ‘Bargaining Chip’ or Confirmed Labour Migration Policy?